The Wildflower Bulb Blanket mix is designed to blend well when planted around bulb plants. It is a shorter mix of flowers that will provide color amongst these plants after the early blooming bulbs have withered. These flowers have also been selected for their cold tolerance so that they require less maintenance and may winter in Zones 7-10. 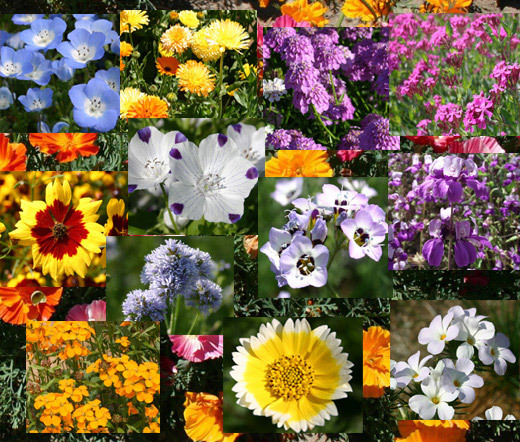 This is a cool season mix that will provide early, diversified, colorful flowers that can be either spring or fall planted. The wildflower mix contains: Calendula Pacific Beauty Mix, Poppy California Mission Bell Mix, Candytuft Mix, Catchfly, Godetia Dwarf Single Mix, Baby Blue Eyes, Coreopsis Plains Semi-Dwarf Yellow, Wallflower Siberian, Chinese Houses, Five Spot, Globe Gilia Globe, Mountain Phlox, Tidy Tips, Gilia Bird's Eye.